Traveling to New York City with a 5-year-old doesn’t mean you have to give up everything you love about the city, like shopping, theatre, and dining. It just means your options are going to be slightly—altered. My husband and I took our 5-year-old son Harry to the Big Apple this summer, and he loved every minute of it. We did, too. 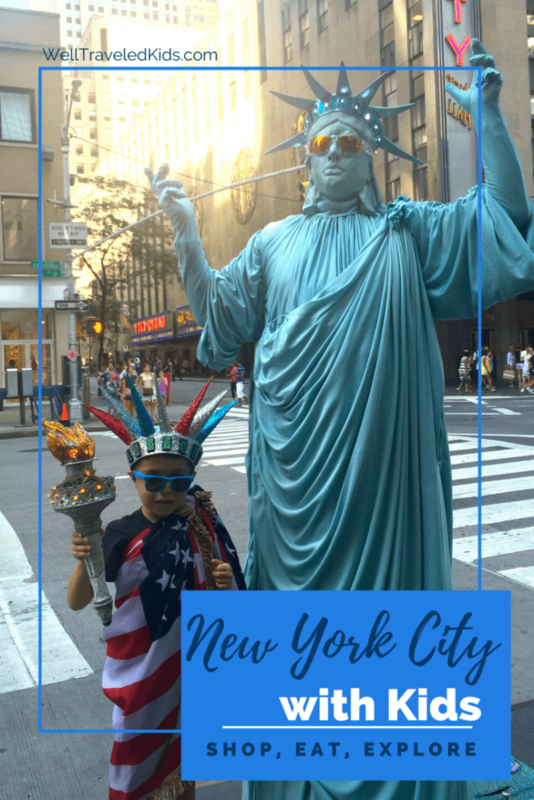 (For more tips on successful sightseeing with a 5 year old in New York, check out Part 1 of this series that includes great NYC spots to visit with kids like One World Observatory. Family Adventures in New York City Kids! You’ll still get to do plenty of shopping; it’ll just be for toys and candy. New York offers great options for the younger shopper. There’s a Lego Store and NBC Experience shop in Rockefeller Center and a mega Disney Store right in Times Square, where Harry picked up a Minnie Mouse dressed up as the Statue of Liberty. It’s a different kind of shopping than I was used to in New York, but definitely still fun. 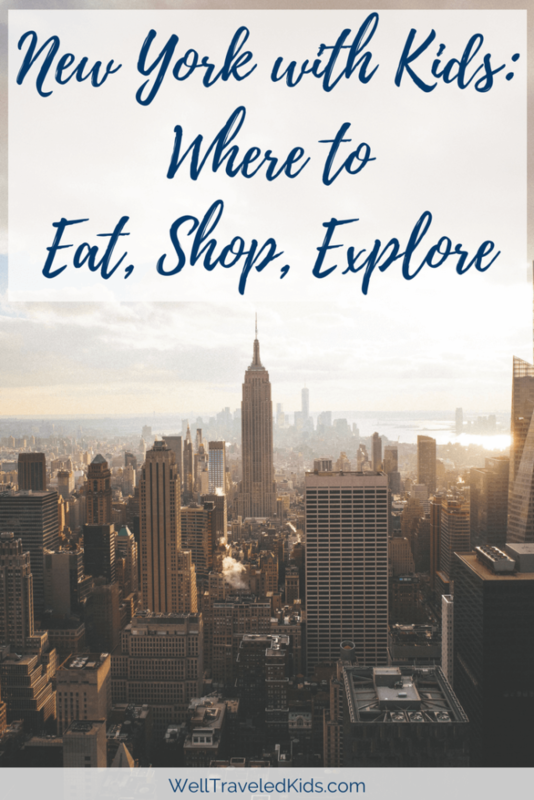 Checking out the food scene can still be a big part of your experience in New York City, but you’ll probably go to different restaurants than you would as a couple. Harry loved trying legendary NYC cheesecake, pizza and bagels. We went to the famous Shake Shack as well as Junior’s for the most fabulous cheesecake. John’s Pizza offers classic New York-style pizza in the theater district, but our favorite place to eat was Ellen’s Startdust Diner, where the singing wait staff serenades you through the dining experience. The restaurant has two levels, and we sat on the upper so we could really see everybody belting out their tunes. We also loved Serendipity 3, the famous dinner and dessert spot on the Upper East Side. After a tasty dinner we ordered the frozen hot chocolate for dessert, which was a thrill for Harry, who tends to stick with vanilla ice cream only. Finding a nice, comfortable hotel in New York is key. You’re not going to spend a lot of time there if your busy sightseeing, but you’ll want to make the most of it when you do. I tell my friends to make sure to get a hotel room near where you want to sightsee. We were big fans of the Westin Times Square. We used our Starwood SPG points and booked a fantastic suite, which was really large and comfortable. Harry had a pull-out bed in a separate divided part of the room, where he could go zone out with his own TV in between long sight-seeing days. Everything about it was convenient for families—with the lights of Time Square, the subway, and convenient stores all right there. I also appreciated that the suites were large and newer compared to most of the old New York hotels. Even though your kid probably doesn’t use a stroller anymore for everyday life, bring an umbrella stroller. You walk everywhere in New York. You could walk a mile just getting around the subway. The stroller will come in handy—trust me. It’s also helpful when you’re walking through extra crowded areas. Put your little one in the stroller and push ahead. The kid can look around without getting separated from you. Seeing the city of New York through the wonder of a young kid’s eyes—you don’t know where it’s going to take you or what your kid will want to do. Make only a couple of plans each day, and just see where you end up. Put the Uber app on your phone. Living in Chicago, we’re used to using Uber, but the car service has been the best thing to happen to Manhattan. In the past, New York taxi drivers were a mean bunch, but we’ve had really pleasant experiences using Uber. Drivers offered us everything from cold water to advice about things to do and see. If you have never used Uber before, you can use code 515ba or use this link for $5 off your first ride! Bring an ID tag for you kiddo. Pin it in their pocket or pin it to their clothing in case you get separated. Make sure they know where it is, and have a plan if you get separated. Every morning before we left our suite, we reviewed our plan with Harry: to find a mommy or a police officer, and show them their tag so they can find us. Give your kid a camera of their own or let them take photos with your phone. There are so many people, places, and things to photograph in the city. Harry loved taking pictures of the buildings and the larger-than-life animals at the toy store. I’m not talking about people on the street. I mean the myriad Mickeys, Minnies, Statues of Liberty, and Sponge Bobs who stand outside of the toy stores or in Times Square just waiting to take a picture with your family—and then charge you for it. When we first got to Toys R Us, an Olaf jumped in for a photo with Harry, who definitely wanted a picture with one of his favorite characters. But then Mickey came over…and Sponge Bob…and the Statue of Liberty. And after we took the photo, they each demanded $5. It can be intense, so be ready. Carry a small, cross-body purse with essentials or a backpack with extra clothes, but nothing of value. New York City is huge, and you’re going to be paying attention to your kid, less so your surroundings. Travel light, and make sure you’re safe. We never felt unsafe, but I always like to be prepared for anything. When we flew back to Chicago five days after arriving in New York, we were all sad to leave. There were a lot of things on our to-see lists that we just didn’t get to. And two months later, Harry is still talking about all that we did. Who would have guessed we’d have so much fun in New York City with a 5-year-old?! Sounds like a great trip! That is sad about FAO Schwartz though. Ellen’s Stardust Diner sounds pretty cool, my kids would probably dig it! Oh and I totally hear you on the character thing! They have them in Las Vegas too…so annoying. I am spending a Mommy and Me weekend in NYC over Christmas time and your article was very helpful. He is 4 years old and I was struggling about whether or not to bring a stroller. Considering we will walk from Macy/s to Bryant Park to Rockefeller Center and the window displays on fifth avenue, I am leaning towards bringing the stroller. Thanks for the Uber tip, I use it all the time and did nt know it is convenient to use in Manhattan, I figured the yellow cabs had a monopoly on that service! Have a great day!